Yours Clothing are known for having some of the best and most affordable plus size clothes online and on the highstreet in the UK today. I love how much variety there is and I can shop from basics and workwear to holiday clothes and special occasion outfits all under one roof. However what I wasn’t aware of until recently was that they actually have an incredible selection of wide fit sandals, shoes, heels and boots too. Did you know that Yours Clothing sold wide fit footwear? If you didn’t then you’re in for a treat as I’ll be sharing my top 5 picks for the season in todays post and if you did know that they have a great range then why the devil did you not tell me sooner? I’m going to be strutting around like Puss in Boots from now on, pleased as punch with my new shoes; except, its spring, so I’ll be in sandals. Gotta show off that pedicure, girl! The great thing about Yours Clothing footwear is that they range from a women’s size 4 through to a size 10 which many shops don’t cater for and the shoes are available in a wide fit E or EEE width. A lot of the shoes have a comfort insole too, especially in their heels, which is music to my ears as while I do love the way that wearing heels makes me stand and walk, I hate how uncomfortable they can be and how much they hurt my feet which is what stops me from wearing them. Whereas the comfort insole helps to absorb a little more of the pressure, meaning I can dance like no ones watching for far longer. My top pick for heels has to be the black peeptoe platforms which I’ve worn myself and can tell you that they’re SO comfortable. The heel isn’t very high because of the platform which gives you the additional height without the pressure on the ball of your foot. The surprise bargain for me on the Yours Clothing site are the gorgeous Rose Gold Cleated Platforms at only £8.99! With their chunky white sole, they’ll be sturdy and comfortable on your feet while you’re looking mega trendy this summer. Pair them with printed trousers and a woven top or pop them on with a denim dress for the ultimate summer look. I recently bought this denim bardot top but sized up to wear it as a dress and I think they’d look fabulous with it! These shoes are perfect for those sunny afternoons where daytime drinks al fresco turn into a party night as they’re bang in the middle of casual and clubbing. For the last two summers, espadrilles have been big news. They’re not going anywhere this year either so if you haven’t bagged yourself a pair already, then add the Black Floral Crochet Espadrilles to your shopping cart. 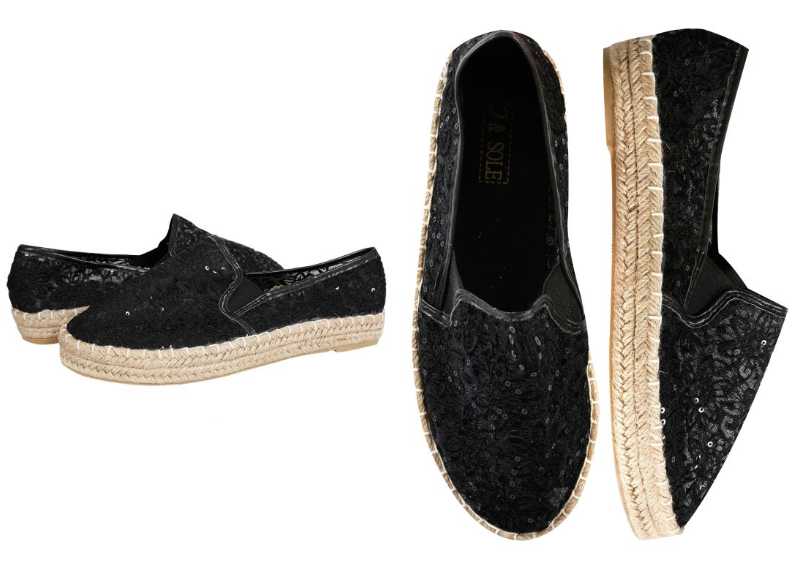 I invested in a pair of the Chanel black leather espadrilles last year and while they’re beautiful, they’re not worth all that extra money when you can pick up a gorgeous pair like these with subtle sequin detailing for only £18! If you’re on the hunt for higher end dupes for your holidays this summer, then skip the pricey Birkenstock brand and check out the dupes from Yours Clothing. I’m loving the White Two Strap Cork Effect Platform Sandals, an absolute steal at £17 and a buy that will see you through the whole summer whether you’re poolside, walking around a Spanish market or heading out in a cotton maxi dress to sample the local delicacies at night. My final pick has to be the White Rhinestone Toe Post Diamanté Sandals which could be worn to so many different occasions, be it on holiday or at home. If you’re not too keen on wearing heels, these are ideal as they’re flat and comfortable but the rhinestone jewels give them that added sparkle that will ensure they’re not out of place as occasion wear or on an evening out. 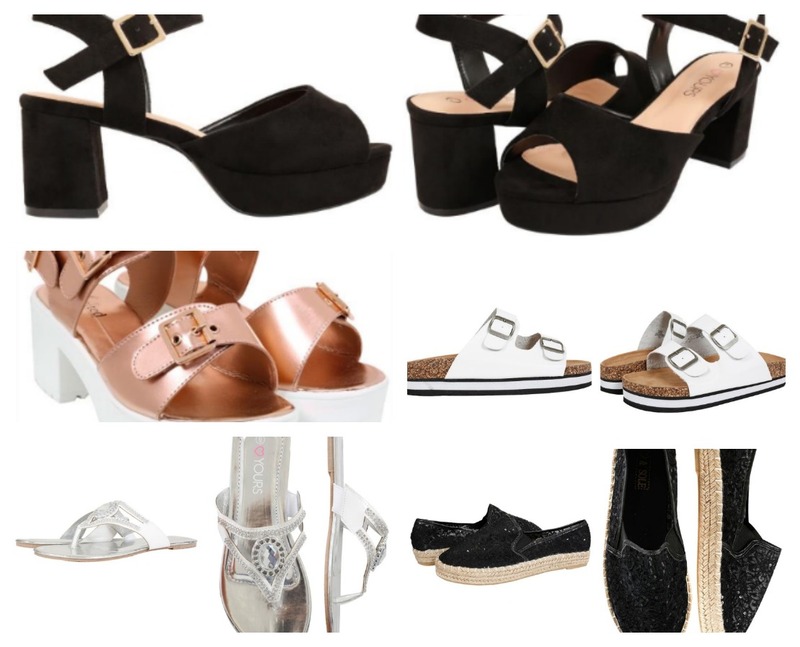 A girl can never have too many pairs of shoes so without further ado, strut on over to the Yours Clothing Wide Fit Footwear section to take a look at their fabulous range, all at the affordable prices that you’d expect from Yours Clothing. Some styles are available in store, including a gorgeous pair of rose gold sandals that I can’t wait to pick up next time I visit the Metrocentre store but if you want to shop the full range, online is the place to be! Which of these wide fit shoes are your favourite? I love those rhinestone toe post sandals and an amazing price too! They are so pretty. lovely selection of shoes, but I actually have the problem that my feet are quite thin for how long they are, so I hate it when places only have shoes in wide fit hahaha! I've never heard of Yours before, great selection! I love yours for their shoes. I have such a wide foot it making buyinh shoes a nightmare! I love wide fit shoes, my feet tend to swell so they are a godsend.